One of the things I have, which some people wish to have in their house is a pool. 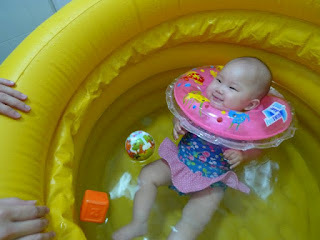 I have got a mini pool at home. Or maybe you could call it a tub. Grandpa got this tub not long ago from his friend, whose kid has outgrown it. It is an inflatable tub which is pretty huge. It is placed in the common restroom at home. So sorry for the visitors using the restroom. This tub has put them in a pretty tight squeeze. Mummy and daddy will fill up the water, put me in my swimming costume, don the inflatable float for me, and dip me into the tub of water. This helps me move my limbs more, especially the legs. As I do not have much control over my muscles, it is difficult for me to move my legs much. My legs aren’t exactly light and small (I am now a big baby. I eat cereal now…ok), so being in the water gives me the weightless feeling, enabling me to move the legs much more. This is me and mummy while changing the swimming costume for me. And this is me in the water kicking around. I know mummy and daddy secretly wants such a tub for themselves too. I can hear them whispering if only I could take a dip in the tub. Well…both of you better not. Especially daddy. He is so many times heavier than me. He will probably deflate the air out of the tub.I still want my pool time!